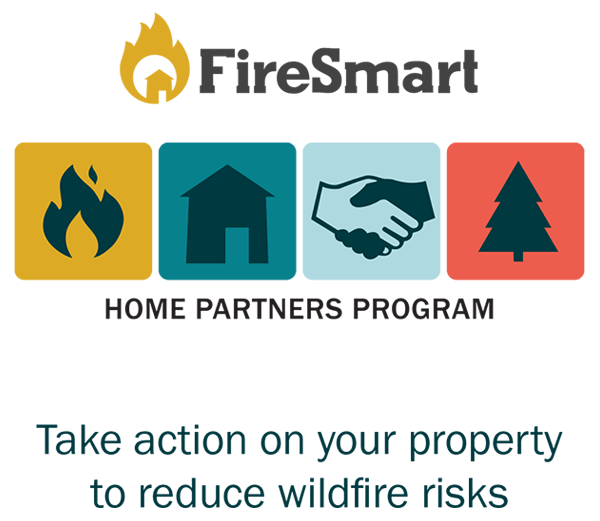 The FireSmart Home Partners Program is a collaboration between FireSmart Canada, provincial governments, local governments, Indigenous communities, the private sector and homeowners in Canada. The program’s primary purpose is to engage homeowners in voluntary wildfire mitigation activities by offering a professional home assessment with property-specific recommendations. The assessment process accurately evaluates a home and property for wildfire exposure, while engaging the homeowner in their unique risk and ways to reduce it. An opportunity to earn FireSmart Home Partners certificate acknowledging your mitigation achievements. The certificate is given upon successful completion of required mitigation actions and an on-site follow up inspection. This type of recognition can be used to enhance real estate transactions by reassuring prospective buyers that the appropriate level of wildfire risk reduction has been achieved on the property. Visit www.firesmarthomepartners.ca and complete the online application form to schedule your assessment. A FireSmart Home Partners Assessor will follow up with you to confirm your appointment. You can also contact FireSmart Canada directly with specific questions on the FireSmart Home Partners Program. HOW LONG SHOULD I EXPECT AN ASSESSMENT TO TAKE? A FireSmart Home Partners Assessor will visit your property to complete a comprehensive assessment of your home and property. The assessment will take between one and three hours to complete, depending on the size and complexity of your property. We ask that you are present and participating in the assessment. WHAT WILL THE FIRESMART HOME PARTNERS ASSESSOR BE LOOKING FOR? During the initial assessment, a FireSmart Home Partners Assessor will walk the property and collect data to create a report on what mitigation work needs to be completed. Your assessor will complete a detailed assessment of the building materials used, home design and the condition of each component of your home. The assessment will be interactive and your assessor will explain everything as they complete the assessment. The assessor may require mitigation that involves tree removal and possibly roof/siding or other modifications. The assessor will also be working with you to mark trees for removal on your property. Following the assessment of your home, the assessor will work their way out through each of the FireSmart priority zones to assess landscaping, vegetation and combustible storage. Once your assessment is complete, a report will be generated consisting of all of the mitigation work and provide a FireSmart work plan for your home and property. This will be sent to you, along with resources to assist in completing any home retrofit work or forestry contracting. These are some helpful tips to get you started! Your FireSmart Home Partners Program Assessor will provide a work plan with recommendations for your home and property. Remove leaves, pine needles and other debris from your roofand gutters. Mow grass and weeds within 10 metres of the house to 10 centimetres in length, or less. Clear all dead plants, leaves, and weeds within 10 metres of your home. Maintain a 1.5 metre noncombustible zone around your home and deck by sweeping or raking down to mineral soil, rock or concrete. Clear vegetation and debris along both sides of combustible fence lines. Move combustible items such as toys, patio furniture, cushions, decorative items, fi rewood, and potted plants, that are on or under your deck and within 10 metres of your home. Move all combustible items into your home or garage and fi nd permanent storage. Propane tanks should be moved to 10 metres away from structures. Remove weeds and other debris from area around large stationary propane tanks so there is no combustible material near tank. * Any loss or damage that any person may sustain as a result of the information in, or anything done or omitted in reliance on this webpage; and any personal injury or bodily injury, including death, and any loss or damage caused by a wildfire to insured or uninsured structures and/or property where FireSmart principles have been applied.